To get a better understanding of our user group, we made a user experience map. Through this, we created a persona called Andy Wong. Andy is 22 years old and is playing college basketball. He had a serious injury and is just now recovering from this. 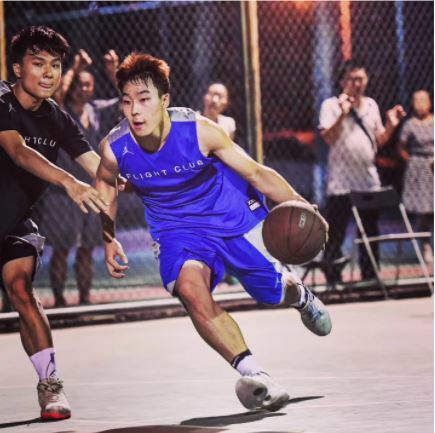 His dream is to play professionally in the NBA and is working very hard towards this goal. He was a rising star, but have had troubles recovering completely after the injury. After hearing about the smart brace he decides to try it out. Through practice he gets feedback on when he does a bad movement, and his awareness of this is now increased. His physical therapist can look at the data in order to analyze how the rehabilitation is going. In the beginning he has to get used to the device, but after this process he is now familiar with the product and reduces his amount of bad movements every training. The physical therapist looks at the data, and sees how much he has improved. He is now allowed to get off the bench again, and gets to play. Through use of the device he has improved the recovery time and is therefore ready to play matches again. Our user group is not only intended for pro or semi-pro level, but our product will be helpful for anyone in rehabilitation from injury. As of now we have only made the product for use as an ankle brace. However, it is very adaptable to other types of braces. This will therefore help in a larger variety of sports. If used for water sports we would have to make it water resistant which is not the case of now, however this user group would be a possibility in the future.